Amazon.com’s Kindle Fire tablet appears to cost about as much or maybe a little more as it sells for — about $203 — according to a teardown analysis by IHS iSuppli. This essentially confirms what everyone has suspected for awhile, that Amazon expects to lose a little money up front on the $199 Fire in hopes of selling it large volumes. It also hopes to make more money on sales of digital media and physical goods that consumer may order from Amazon on the device. Andrew Rassweiler, the IHS iSuppli analyst who supervised the teardown, said the analysis is still under way and that the firm may reduce its final estimate slightly. 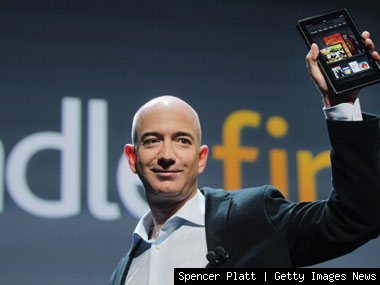 That Amazon’s model with the Kindle Fire is essentially opposite that of rival Apple’s has been well understood for some time. Apple’s iTunes store runs at or slightly above the break-even point and encourages the sale of higher-margin hardware like the iPad, iPhone and iPod. The teardown study gives both a rough idea of how much Amazon can realistically expect to lose on the Fire, but also the extent to which it took steps to minimize those losses. There are several examples where Amazon clearly intended to minimize its hardware cost, Rassweile says. For one thing, most tablets contain eight gigabytes of DRAM memory. The Fire contains only four. It also contains only eight gigabytes of flash memory used for storing content, where the iPad starts at 16 and goes up to 64. Amazon also skipped other features, like a camera and Bluetooth connectivity, and more expensive wireless chips. “All the choices have been made here to minimize the hardware cost,” Rassweiler says. “We expected to see a certain wireless module that’s commonly been seen in other tablets, and we were surprised that it wasn’t there. There was a cheaper one with fewer features that saved them a few bucks.” The chips were combined into a module manufactured by a previously unknown company called Jorjin, he says. The box contents are also minimal. The box the Kindle Fire ships in is also the same box it comes in when sold by third party retailers like Best Buy. And the only accessory inside is a wall charger and a cord. Rassweiler says iSuppli initially expected the box contents to cost more than $5, but instead the cost is closer to $2 or $3. “Amazon’s approach was to take out everything they didn’t need,” he says. But as is always the rule with consumer electronics, prices come down. That $25 worth of TI chips will cost about $12 in the near future, meaning that Amazon will in time be able to sell the same device but at a much lower cost to build, meaning. Of course if it’s successful, consumers will want one that’s a little more fabulous, perhaps with a bigger screen, for example. Inside the Fire, chipmaker Texas Instruments appeared to be the big winner, supplying numerous chips that combined for about $25, or about 12 percent of the total materials cost. One TI chip, the OMAP4430, is the main applications processor in the fire. It has previously been seen in the Droid Bionic, the LG Optimus, and Research In Motion’s Playbook. TI also supplied chips that help manage audio, power, and Wi-Fi. It’s a victory for TI, which appears to have beat out Qualcomm, who supplied Hewlett-Packard with the applications chip in its now-abandoned Touchpad tablet, as well as Nvidia and Broadcom who have been competing for business with other tablet outfits. South Korea’s LG Electronics supplied the display. LG has a relationship with E-Ink Holdings, the company that has supplied the displays on Kindles and also the Barnes and Noble Nook since the beginning. LG is also thought to supply displays to Apple for the iPad. Along with the display are touchscreen components. Rassweiler says the touchscreen controller chip is from a previously unknown supplier known as Ilitek. The appearance of lesser-known suppliers for these components is increasingly common, Rassweiler says. A surge in demand for touch devices has brought forth a bumper crop of new companies supplying the components that make them work. Amazon declined to comment directly on iSuppli’s findings, but CFO Thomas Szkutak said in a conference call with analysts on Oct. 25. that the company is counting on the device to serve as a platform for the sale of content, and emphasized the “lifetime value,” of the device. It may just work. Amazon is said to be seeing higher-than-expected demand for the Fire, and is reported to have ordered another million units from its manufacturing partner, Taiwan’s Quanta Computer. Still, it will take many more than that to make a dent in iPad sales. Amazon shares fell by more than 4 percent today. The shares are down from a recent peak after the company disclosed an earnings miss on Oct. 25.